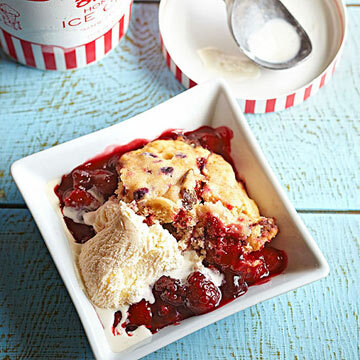 This creative slow-cooker recipe takes advantage of several shortcut ingredients, including muffin mix and canned cherry pie filling, for a simple cozy dessert with very little effort. Lightly coat the inside of a 3 1/2- or 4-quart slow cooker with cooking spray. In the prepared cooker combine frozen mixed berries, pie filling, cinnamon and ginger. Cover and cook on low-heat setting (do not use high-heat setting) for 2 hours. In a medium bowl, combine muffin mix, the water, pecans and oil; stir just until combined. Spoon muffin mixture over berry mixture. Turn to high-heat setting. Cover and cook about 1 hour more or until a toothpick inserted into center of muffin mixture comes out clean. Turn off cooker. If possible, remove crockery liner from cooker and place on wire rack. Cool, uncovered, for 20 minutes. To serve, spoon warm cobbler into dessert dishes. If you like, serve with vanilla ice cream or whipped cream.